After a week of driving for queenstown rafting my rat was starving. A huge low had just passed over the lower south island bringing the Shotover river upto 220cumecs & washing out parts of the road, the Kawarau rose to over 600 cumecs and Lake Wakitipu was edging closer to flood level. Thursday morning Megan & I headed out to check out Nevis Bluff at high flow, we were stopped by road workers blasting rock from above the road. We caught a glimpse of some big brown crashing waves from over a km upstream. 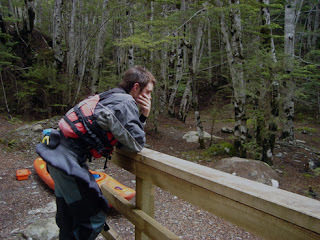 On the way back to town we stopped and check out the few of the DogLeg Rapid, quite washed out with the high flow. After some lunch we loaded the creek boats and headed out to 12 Mile Delta, a 40 minute walk up a well looked after walking track you come to San Somers Hut. Just behind the hut lies a sweet 6-7metre drop. After some humming & harring I decided that the drop was good to go, we planned some safety and set up some cameras. 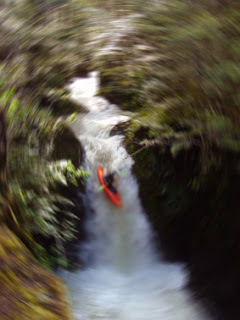 I ran the falls twice with varying levels of success, a large boil pushes you into a small cave on river right, which isn't too bad & you can paddle out of successfully. 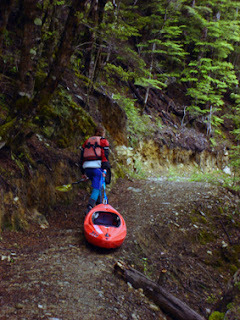 I then climbed out just below the drop and walked downstream with Megan, as we didnt like the idea of paddling the tight wood filled canyon at this high flow. 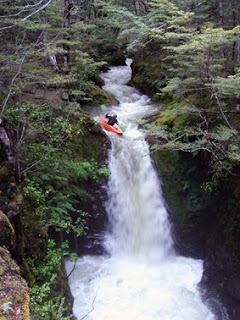 We put in halfway down & ran some small & tight rapids. With a few sizable portages around wood infested sections. 12 Mile was sick, and can't wait to have another opportunity to explore the rest of the river & possibly the section below the Glenorchy Road (Altough this section traps even more wood. Up North Part 2 : Manganui a Te Au?